I want to take a break from talking about vintage recipes and such to talk about something else near and dear to my heart, vintage shaving. I first was interested in vintage wet shaving about 5 years ago. 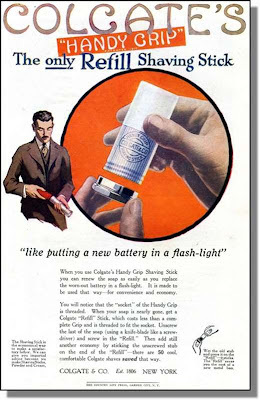 Dissapointed by the poor quality of disposable razors I searched for something different that made sense and I discovered that vintage wet shaving was very much alive and well. You can buy your mach5 or 8 bladed razors and what are they? Manufacturers gimmicks meant to part you from your money with promises of the closest shaves ever. Complete and utter flummery in other words! In reality, our grandfathers knew what we have forgotten... A old style razor fitted with a good quality double edge blade gives a better, closer shave than these new disposables can even hope to achieve... and at a fraction of the price as well! You can also leave the men's facial washes in the drawer. A good shaving soap or cream when applied with a good quality badger hair brush is supremely effective at exfoliating the skin. Once one enters the world of vintage wet shaving, the problem arises of who to buy from? Where do I get my razors from? Personally I use 2 vintage razors to shave, a Gillette clone razor from 1935 and a Valet Auto Strop from 1912, the former being double edge and the latter being single edge. You don't need more than 2 although I know some people who go whole hog and become collectors, creating a museum in their bathroom. No, the real point is to get a superior shave with a superior product and save some money at it. Enter Shoebox Shave Shop. They have been my proprietor of shaving and bath supplies for almost a year now and their service is un paralleled. I first found them when I was on the hunt for the esoteric cologne "Florida Water". I was taken in by their site design and ease of navigation but more importantly I very quickly realized that Shoebox Shave Shop is well stocked with products you're not going to find anywhere else. Despite having such rare European toiletries and the full line of Murray & Lanman products (which I haven't seen since I lived in New Orleans), their prices and shipping are very good compared to other online boutique shaving shops. My latest order was a doozy, including many soaps for both me and my wife (yes they have women's products as well). When it arrived it was a centerpiece for how business used to be done. Each item was well wrapped to insure protection, there were freebies included and as with my past orders the packing list included a handwritten thank you note. It's nigh on impossible to find service like this anymore. Take it from me, spend some time and go look over what Shoebox Shave Shop has to offer. I'm sure you'll find something you want to try, and when you order, tell them The Vintage Recipe Blog sent you. This is NOT a paid advertisement, all content is written from the heart giving free links to a company whose product I enjoy and believe in. I love cooking so much and as I take a peek on this Gourmandia site, I found out that there are more than recipes in there... It offers a lot from broad collection of recipes to cooking skills and napkin folding. Thanks for having this. You must try to take a tour on this site! A package site!